Just when you thought things were bad in Guatamala’s capital city, they figure out a way to get worse. In the wake of Tropical Storm Agatha, which bulldozed the Central American country of Guatemala from the Pacific Ocean side and killed 115 people in the region, Guatemala City has a new enemy. 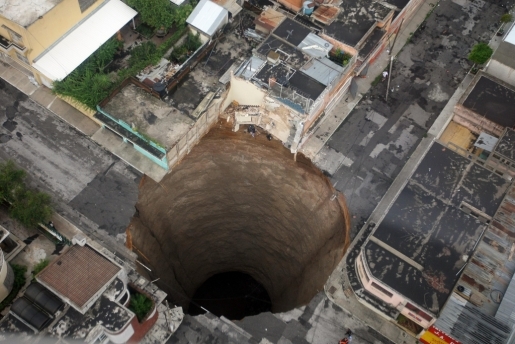 Thanks to the water coming ashore, a giant sinkhole has opened up right in the middle of the capital city! Oh yeah, the Pacaya Volcano also erupted on Friday, just to make matters a little worse for the hard-pressed people of Guatemala. It almost looks Photoshopped, doesn’t it? It’s just so unnerving that it can’t be real, but it apparently is. I took a look at the highest quality image of the hole I could get on Flickr, and I can’t see a bottom to that massive pit. I’m sure there is one, but it looks like it might be a little ways down there to me.